Prior to joining NZF, CEO Iqbal Nasim worked in the finance sector for 5 years. Iqbal holds an MSc in Voluntary Sector Management from Cass Business School and an MA in Economics and Management from Cambridge University. He has spoken about Zakat and NZF extensively across the UK and also at an international level as a speaker on the topic of Zakat at the Global Donors Forum, convened by the World Congress of Muslim Philanthropists in Washington D.C. and at the 10th World Islamic Economic Forum in Dubai. Iqbal is also chair of the Muslim Council of Britain’s UK Refugee & Asylum Seekers Response Taskforce which was set up in September 2015 in response to the growing refugee crisis. MuslimView (MV): For those that wish to know more about National Zakat Foundation, what can you tell us about the charity? 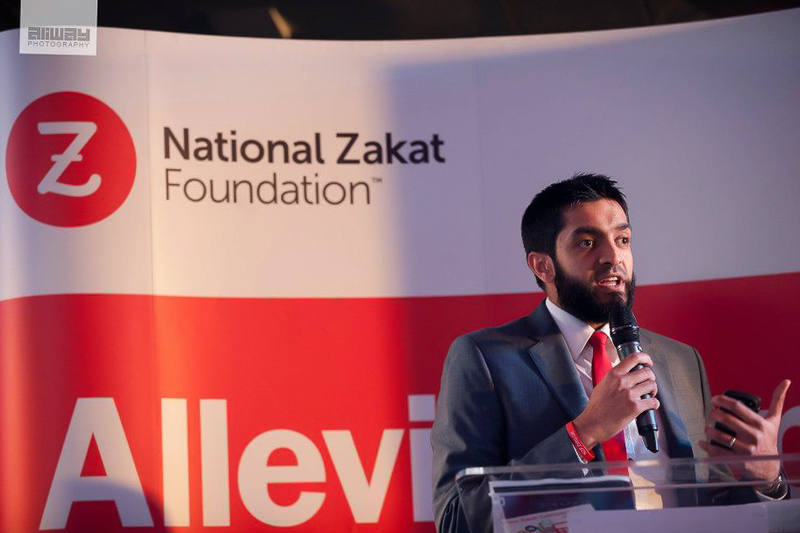 Iqbal Nasim (IN): The National Zakat Foundation (NZF) works to strengthen and enhance the UK Muslim community’s engagement with Zakat and to improve its impact on the most vulnerable members of our community nationwide. We provide an end-to-end Zakat service encompassing education, calculation, collection and distribution of funds for the benefit of local, deserving recipients. Since launching in 2011, NZF has distributed over £3m of Zakat funds to some of the most destitute and needy members of our community. Through hardship grants we have helped transform the lives of over 3,000 families and individuals facing severe financial difficulties. We have three supported housing projects for Muslim women which house close to thirty women at any one time, who might otherwise be homeless. In addition, we also run an ex-offenders rehabilitation project for young Muslim males. In addition to our Zakat distribution arm, NZF provides a number of services for Zakat payers including a comprehensive Zakat guide, an online calculator and Knowledge Bank, as well as a query service. MV: Can you tell us a bit about the organisational structure and your role within the charity? IN: I am Chief Executive of NZF and am fortunate to have had the opportunity to speak extensively about Zakat and NZF across the UK as well as at an international level. NZF has a small but dedicated team. There are three main parts to our organisation. Zakat services, which is divided into two teams; a team to cater for the educational and calculation support needs of Zakat payers and a Zakat distribution team for recipients of Zakat. All our marketing and advertising is handled by our Communications and Community Relations teams. Finally, we have a support team including Administration, Finance and HR functions. MV: NZF is a UK based charity. Why is it important to distribute Zakat locally? IN: There are thousands of individuals here in the UK who are in desperate need and eligible to receive Zakat. Our core message is ‘Zakat begins at home.’ We expect 1,500 applications or referrals in the coming year from people in desperate need. Supporting them is not just an option for Zakat payers in the UK; it is our collective obligation. MV: What proportion of the Zakat is actually used to help those in need? How quickly does the money get to where it is needed? IN: 60 to 70% of hardship grants are allocated to individuals and families in need. 20 to 30% go towards four supported housing projects for homeless women as well as for ex-offenders. A maximum of 10% is spent on caseworkers who are administrating grants on a day to day basis. All other admin costs are covered using non Zakat funds. Our Zakat policies are authenticated by the Al-Qalam Shariah Panel and we ensure that Zakat payments are distributed within one lunar year at the very latest, so around five to six months on average. MV: Zakat distribution has a few conditions attached to it. When people donate Sadaqah via NZF, are the funds donated differently (to a wider audience) than their Zakat donations? IN: Yes, we accept general Sadaqah donations which are then used for those costs that cannot be funded through Zakat contributions. At NZF, non-Zakat funds are what keeps us going in many ways, because they allow for us to do all the Zakat work that we are involved in. We can’t raise Zakat without investing in marketing and awareness efforts for example. Also the development of all of our Zakat education and calculation tools are funded with non-Zakat funds. Finally, all our core/administrative costs are met with non-Zakat funds too. When someone gives Zakat to NZF, that is us helping them fulfil their obligation. But when someone gives Sadaqah to NZF, that is them helping the organisation to fulfil its objectives! MV: What advice do you have for people paying their zakat this year? Finally, I would recommend making sure that least a portion of your Zakat is paid locally. In the famous hadith when the Prophet (peace be upon him) sent Mu`adh ibn Jabal (may Allah be pleased with him) to Yemen he told him, “Teach them that Allah has imposed upon them a charity to be taken from the wealthy amongst them and given to their poor…” (Bukhari). To stay up to date with NZF activities, sign up to the newsletter here.